The day after my birthday I decided to take a ride with my birthday loot to the Baseball Card Store in Midland Park, NJ. I was armed with cash and some trade bait in case they did that kind of thing. 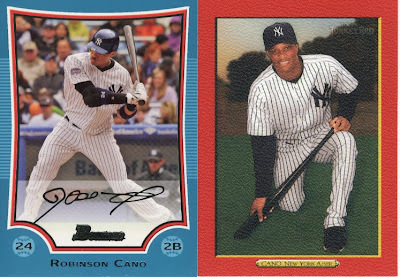 I wanted to just find some cards I needed to fill holes in my collection, and pick up some Ultra Pro sheets for the T206 mini and Goodwin mini cards. The shop is a decent ride from my house, about a half an hour so me and my Dunkin Donuts coffee were well prepared. 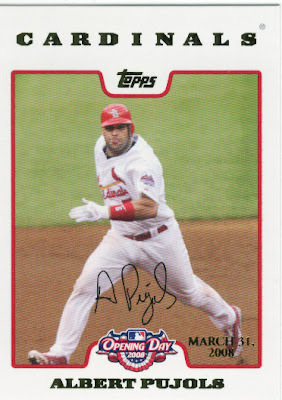 I got to the shop and the owner was like, "hey, you're the girl that collects Pujols, right?" I was amazed considering I had only been there once before and said yep, that is me. He proceeded to tell me he had put some Pujols cards aside for me but didn't know where they ended up. That sounds like more or less everything in my room that needs organizing. We talked for a good while, I rummaged through plenty of cards in cases and boxes and pulled out some cards I liked a heck of a lot. We also got into a whole conversation about receiving damaged cards and the course of action to be taken afterwards. 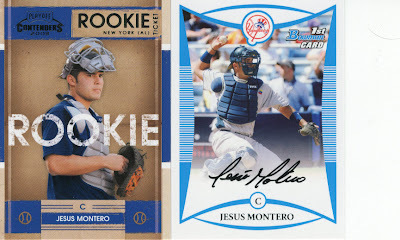 I explained my Yankee Stadium Legacy damaged cards from a case break of UD Heroes a while back and Dave kindly emailed his UD contact with the story and forwarded my information which was way cool of him to do for me. I also proceeded to show him my "big hits" from the 2009 Unique.... Obviously he thought I got hosed as did everyone else on Earth. When it came time to pay up for my loot I asked if he would consider a few cards for trade in the deal and he said to show him what I brought. He took 3 game used cards out of the bunch, a 2008 UD Heroes Pujols GU (I had 2 of those), a 2009 Icons Jorge Posada GU, and the T206 Ichiro GU. I suppose you want to see my loot? I didn't scan the Ultra Pro sheets, but I left with those as well. I will be going back to the shop either Friday or Monday for more sheets and probably more cards. 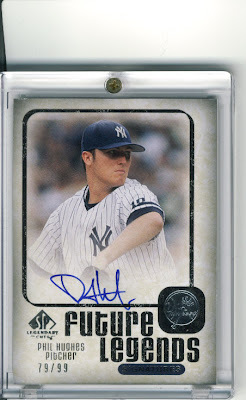 I saw the Hughes card as soon as I walked in and noticed the auto was on card. I am a sucker for on card stuff because it means the player actually had the card at one point, and that there is no sticker (duh). Dave also gave me a 2009 Legendary Cuts Pujols and 5 or 6 YSL cards to see if I needed them, and if not to just bring what I don't need back to him. Clearly he took pity on the crazy person trying to complete a ridiculous set. Overall the trip was a "great success" and I will definitely be going back within the next week. If anyone wants the address to the card shop please e-mail me. I also have their e-mail if you are looking for something specific I am sure they can help you out. It's great to have a cool card shop owner. 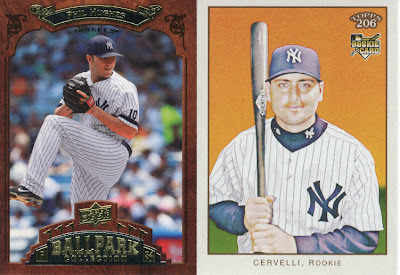 What is Cervelli doing now? Has he recovered from the infamous collision with Elliot Johnson? Good to see his face on a current card. Nice card shop owners are always... nice. They know as well as we all do that they're being surpassed by ebay and the online warehouses, but you CAN still put a price on customer service and the experience of walking around a card store for a little while. Yea, and my local card shop owner clearly doesn't understand that. He's friendly enough but I always feel like he's tryin to pull a fast one on me. Also there is no $.75 or $.50 bin that I hear some bloggers talking about at their local shops, just a $1.00 bin full of cards that could be had on ebay for $.25. I stopped in there about 2 weeks ago on a Saturday, can't remember who I spoke with. (I'm really getting terrible with names, don't get old kids!!) Really nice guy, spoke cards etc for about 30 minutes. Bought some 800 count boxes for the local hospital pediatric floors and he gave me a 3200 count box for free.